Lock in an Istanbul vacation package on Expedia today! This is by far one of the simplest ways to save money and time for your amazing getaway. With more than 400 airline partners and 321,000 worldwide properties, our extensive database can help get you where you need to be. Need more time to decide? There are no hidden fees from us if you change almost any reservation. It's nice to just wander the streets when you're in a new destination, but sometimes it's sensible to have an agenda. Grab your travel program — we have plenty of awesome ideas for your upcoming Istanbul vacation. With such a great line up of world-famous attractions in the one place, you certainly won't be idle in Istanbul! First things first, make sure you snap some selfies out the front of the Hagia Sophia and the Hippodrome. After you've ticked those off, you'll still have the Blue Mosque and Topkapi Palace to visit! With tourist attractions such as Galata Tower and Dolmabahce Palace, there will never be a boring moment in this bustling metropolis. After you've finished looking around those, continue in the direction of Spice Bazaar and Taksim Square. The link to ancient history is strong at Basilica Cistern. Make a booking now and discover the evidence of specialized archaeological study. Visitors in this destination have heaps of options. Are you eager to know more about some of the local cultural and religious traditions? Attend prayer with devoted worshipers at Suleymaniye Mosque and enjoy a look into the Islamic faith. Still have some time on your hands? Wouldn't mind adding some greater meaning to your travels? Go on a pilgrimage to Chora Church. No matter your beliefs, it's an excellent place to observe and find out about the local faith. No matter how comfortable your hotel is, don't spend your stay sealed up in your room or relaxing next to the pool. There are plenty of memorable experiences to be had! For a full range of ideas, go to our Istanbul things to do page. Though Istanbul does have 1,245 accommodations to choose from, it's always smart to reserve a room early. Not quite sure where to begin? Expedia is here to help out with your cheap vacation or luxury getaway. Those with a taste for the good life are sure to enjoy the Four Seasons Hotel Istanbul at the Bosphorus (Ciragan Cad. No. 28) and the Shangri-La Bosphorus, Istanbul (Sinanpasa Mah, Hayrettin Iskelesi Sok). Looking for somewhere a bit cheaper? The Park Hyatt Istanbul Macka Palas - Boutique Class (Tesvikiye, Bronz Sokak No. 4 Sisli) and the Lion Hotel (Lamartin Caddesi No:41 Taksim) are a couple of options that won't cost you an arm and a leg. A real highlight of any visit to Istanbul is the Hagia Sophia. 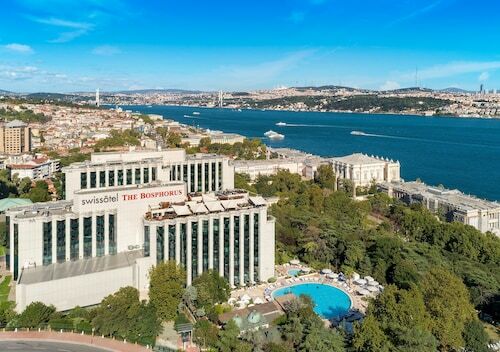 If you're eager to stay within walking distance of this iconic attraction, the Four Seasons Hotel Istanbul at Sultanahmet and the GLK PREMIER Acropol Suites & Spa are both great options. 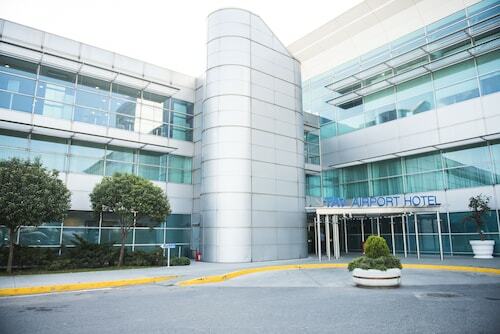 If you're arriving by plane, you'll probably be heading to Ataturk International Airport (IST). Once you've retrieved your bags from the carousel and exited the terminal, central Istanbul will be just 8 miles (13 km) away. Once a church, then a Byzantine cathedral, later a mosque and now a monument, this iconic building is a national treasure. This city square once was the chariot racing and ceremonial hub of old Constantinople, and is still a popular meeting place. Istanbul’s medieval lookout point offers panoramic views across city’s historic district and the water of the Golden Horn. Explore this monument to the decadence and stately grandeur of the greatest days of the Ottoman Empire and see the clock tower, gardens and mosque. Travel from Europe to Asia on the first bridge to connect the two continents, admire the bridge from below during a cruise and visit centuries-old buildings. One of the most beautiful surviving Byzantine churches, with interiors laid out in fine mosaics and frescoes, has been converted into the impressive Kariye Museum. Istanbul’s famous old Ottoman summer palace offers a grand view of the Bosphorus Strait and the Old City, as seen from the Asian side of this multi-continental city. Istanbul’s miniature display on the shore of the Golden Horn gives you a good overview of the city’s most iconic buildings in a family-friendly park. See a hidden gem of Istanbul, an Ottoman house of prayer nearly 500 years old, with magnificent tiles, built in the middle of the market in the Fatih district. Walk across this historic bridge to spot famous Istanbul landmarks and watch the sunset from a bar full of Turkish men contemplating life while sharing a water pipe. Visit this central park to take leisurely strolls through rose gardens, visit visit museums and a sultan’s palace and enjoy views of the Bosphorus Strait. Enter the maze of shop-lined streets in one of the largest and oldest covered markets in the world to browse hundreds of thousands of hand-crafted objects. Located in Bakırköy, this hotel is 0.3 mi (0.5 km) from CNR Expo Center and 1.7 mi (2.8 km) from Sinan Erdem Dome. Istanbul Aydın University and Marmara Forum are also within 6 mi (10 km). DTM-Istanbul Expo Center Station and DTM - Istanbul Fuar Merkezi Station are within a 5-minute walk. Located in Pendik, this hotel is 3 mi (4.8 km) from Viaport Outlet Shopping and within 9 mi (15 km) of Aydos Hill and Pendorya Shopping Mall. Istanbul Park and Neomarin Shopping Mall are also within 9 mi (15 km). 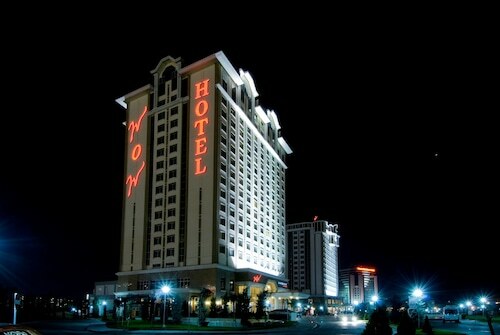 Located in Kucukcekmece, this luxury hotel is within 16 mi (25 km) of Mall of Istanbul, TurkuaZoo, and Grand Bazaar. Suleymaniye Mosque and Hagia Sophia are also within 16 mi (25 km).